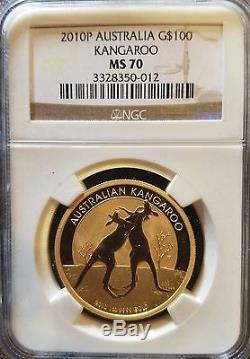 2010 Australia 1 Ounce Gold Kangaroo MS-70 NGC. Graded MS-70 by NGC The 2010 1 oz. Gold Kangaroo features two kangaroos boxing in the outback, design by Dr Stuart Devlin. The Ian Rank-Broadley effigy of Her Majesty Queen Elizabeth II and the monetary denomination are shown on the obverse. 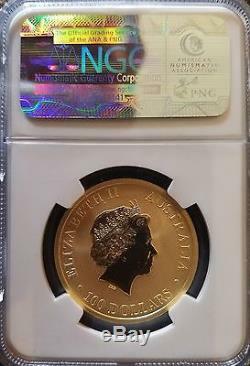 The item "2010P AUSTRALIA GOLD $100 KANGAROO NGC MS 70" is in sale since Tuesday, September 20, 2016. This item is in the category "Coins & Paper Money\Coins\ World\Australia & Oceania\Australia\Gold". The seller is "kfenner1955" and is located in Kamuela, Hawaii. This item can be shipped to United States.